The first time I saw a reproduction of this painting was in a sumptuous multi-volume encyclopedia of art that I acquired for my college library back in 1983. It instantly cast a spell on me and I remember gazing at it for what must have been a full five minutes. I marveled at quite a few aspects of the picture: the way the three-dimensional solidity of interior space was conveyed so cunningly on the two-dimensional picture surface; the way light entered from the open window and bounced off not just the inanimate objects but also the human figures and the dog, presenting us with a harmony of sharply contrasting colours – deep reds, parrot greens, milk-whites, dark tans and sun soaked oranges. I liked the suspended tautness of weighty things – the ornate brass chandelier and the bed screens, each tied at its respective end into a ball, the latter as inviting to the involved viewer’s fist as a boxing trainee’s punching bag. Another surprise had to await the coming of the Internet. It was only after I zoomed in for a close-up (impossible, alas, with reproductions in books) that I noticed the cameos of scenes from the passion of Christ inlaid into the outer fretwork of the convex mirror on the wall at the far end. The amazing richness of detail in this painting is bound to reward even viewers who know nothing about the artist or his ethos. Greater rewards of refined delight await the viewer who decides to do some reading on this artist and the times in which the work was composed. Then it begins to dawn on one that this isn’t just an enchanting picture but one of the landmarks in the history of Western art. And in the rest of this piece, I’ll make an attempt to explain why this painting richly deserves the acclaim it has received over the six centuries of its existence. 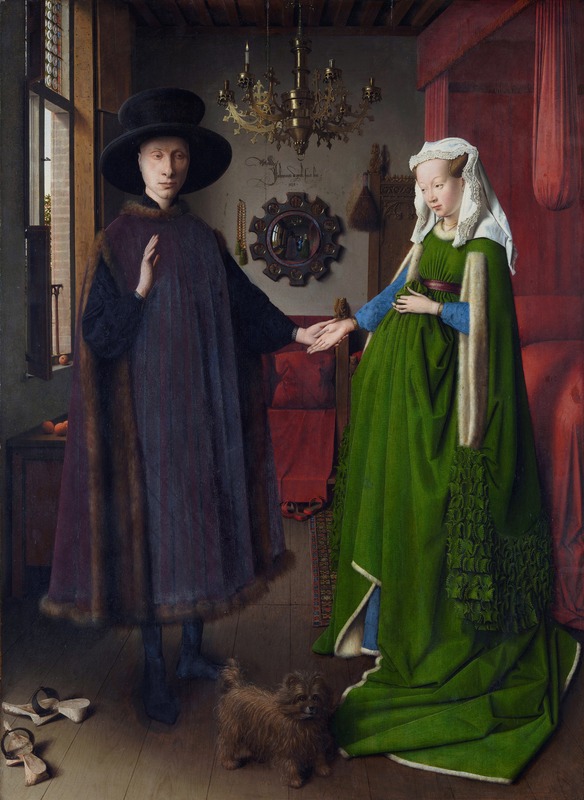 The original of the Arnolfini Marriage today hangs in the National Gallery in London. It was painted in 1434 by the Flemish artist Jan Van Eyck in the city of Bruges – now in Belgium, but then the chief port of the Grand Duchy of Burgundy and a city brimming with mercantile wealth. 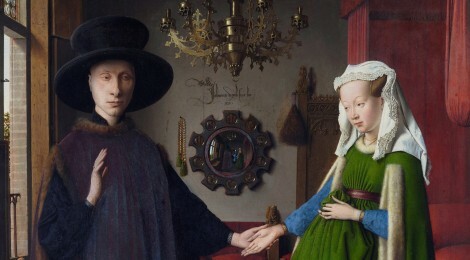 Van Eyck was the first artist to handle with finesse the recently developed technique of painting with oils. Many of his works revolve around Christian themes and he appears, in his personal life, to have managed to combine religious devotion with the quest for professional and commercial success. Two years before he undertook the Arnolfini Marriage, Van Eyck had executed a large and complex masterpiece of religious art, now known as the Ghent Altarpiece, to be placed in a chapel in Ghent. He had been commissioned to do it by a successful merchant who was also sponsoring the building of the chapel. The work brought him acclaim and money. Van Eyck was no struggling artist unlike the tormented penury-stricken genius Vincent van Gogh, centuries later. In fact, he seems to be one of the earliest examples of the artist as independent professional, able to command a high fee from those who wanted either to commission him or to employ him. Until not very long before his time, the only sources of patronage to artists were either the church or the aristocracy. Van Eyck was one of the first artists to attract the attention of a new group of potential art patrons, drawn, again for for the first time in history, from the rising mercantile classes. The fact that his next masterpiece, the subject of our present discussion, was also commissioned by a prosperous merchant, who was himself at the height of his business career, tells us that it represents a historically significant moment of social transition. The great powers of the Church and the aristocracy are now compelled by the force of circumstances to share power with the newly rising class of merchants, a class that will soon catalyze the opening up of a secular and eventually democratic space free from their hegemony. A new age is beginning, one in which individual enterprise rather than inherited privilege will increasingly order the affairs of the world. It is no wonder then that Van Eyck boldly signs his paintings, becoming in this way one of the first great artists to assert intellectual property rights.